Excursion up the Tonle River to Kampong Chhnang either by ship or by coach depending on water levels. In Kampong Chhnang passengers will take a wonderful motor boat excursion into the lakeside wetlands that form the mouth of the river. Here many fishtraps may be seen. We stop at the little-known Chong Koh silk-weaving village for a morning walk. We cruise past the Mekong's timless villages and in the afternoon we stop at the Peam Chi Kang village to visit either the wat, monastery or school. 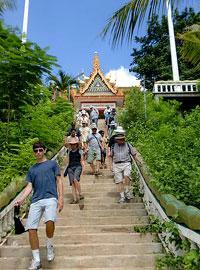 In the morning passengers journey upriver to the hilltop temple of Wat Hanchey. In the afternoon, passengers travel by bus to visit the Twin Holy mountains of Phnom Pros and Phnom Srey (Man and Woman Hill). Continuation to the ecotourism village of Choeungkok supported by the Frech-Cambodian NGO Amica and the Pandaw-supported Kampong Cham orphanage. Early morning coach transfer to the Raffles Hotel D'Angkor in Siem Reap. A packed lunch will be provided and we will stop at Kampong Thom along the way. Arrive at Siem Reap mid afternoon.